Images: (1) A simulated fiber driven by a 3D-stochastic process. (2) A simulated development of 150 fibers that perform a simple random walk. The fibers are not restricted to any layer, but each layer allows only steps of a specific length. 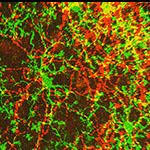 (3) Serotonergic fibers in the mouse insular cortex. Scale bar = 100 µm. 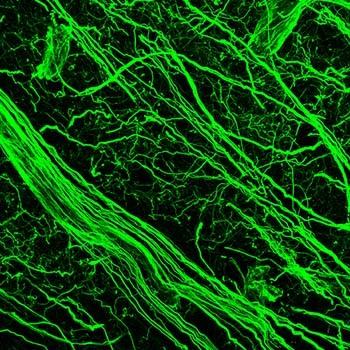 Virtually all neural processes in the mammalian brain are embedded in a matrix of meandering fibers that release serotonin, a signaling molecule that dates back to the earliest multicellular life forms. The density of this "serotonergic" matrix varies across brain regions, and its perturbations can profoundly affect perception, emotional states, and transitions between wakefulness and sleep. In humans, altered densities of serotonin-releasing fibers have been associated with Autism Spectrum Disorder, prolonged exposure to MDMA ("Ecstasy"), and other conditons. It is currently assumed that brain regions use an unknown mechanism to actively build and maintain specific serotonergic fiber densities. We have introduced an alternative and more parsimonious hypothesis which states that region-specific densities arise as a mathematical consequence of the stochastic behavior of individual fibers, with no global supervision (Janusonis (2017) Serotonin in space: Understanding single fibers. ACS Chemical Neuroscience 8: 893-896). In the project, we investigate the 3D-stochastic process that drives single serotonergic fibers. This collaborative effort brings together experimental neurobiology, computer image analysis, and stochastic mathematics. 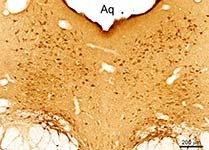 Images: (1) A section through a shark cerebellum. (2) Iba1-positive ependymoglia in the swellshark forebrain. Many elasmobranchs (sharks, skates, rays) have highly evolved brains that conform to the general vertebrate architecture. However, they also show an extreme variability in how brain divisions are built anatomically and used functionally. 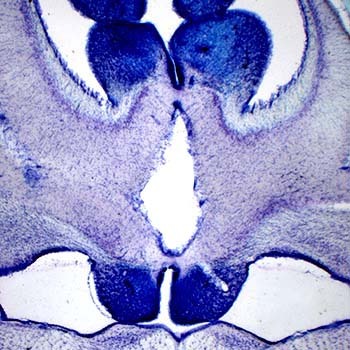 This rich set of possibilities reveals which mammalian brain features are highly idiosyncratic and represent only one realization among many others. It also demonstrates what future brains may still become, by evolution or human design. We study the brain cytoarchitecture of a number of shark species, in both the Galeomorphii and Squalomorphii superorders. Some of the extant clades date back to the Triassic (pre-Jurassic) period. We have recently discovered that swellsharks express Iba1 (a mammalian microglia-specific protein) in radial ependymoglia, a major element of the shark brain scaffolding. We also investigate serotonergic fibers in this clade. Copyright © 2016 The Regents of the University of California, All Rights Reserved.